There are numerous styles of marquees available to hire, traditional tents, stretch tents, clearspan (or frame), yurts and tipis. Most wedding venues offer one option, while other venues offer you a blank canvas where you can hire something truly personal to suit your wedding style. All this choice can seem overwhelming but below is a detailed list of things to consider to make your navigation all things marquee less daunting. Understanding the size requirements for your marquee will depend on how many guests you invite, and how you plan to use the space. For instance, will you use square, rectangular or round tables, will there be a bar, lounge area with chill out furniture, dance floor, firelight ceiling, space for chocolate fountain, photo booth, do you want it lined with fabric etc) Professional marquee companies will guide you logistically and wedding venues with a marquee on their premises can equally offer you advise on the best layout based on your individual needs. Ensure there is enough space for the catering tent! For instance, for 100 seated guests, you will need at least a 9m x 12m marquee as a starting point not including space for the catering space. Don’t be shy, ask to see the marquee actually set up to ensure you are happy with the selected model. 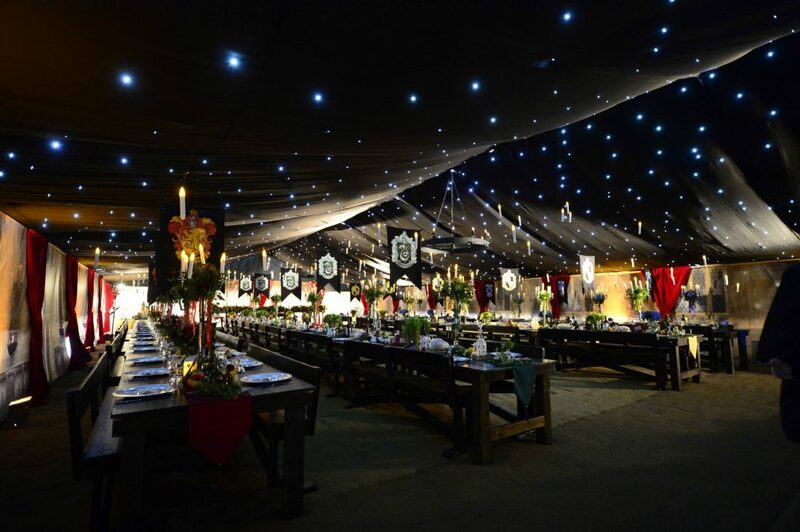 Most marquee companies will hire out tables and chairs, draping fabric, up lighters, props etc…If you want a romantic candlelit reception, find out if the marquee company allow open flames inside or not? Sky is the limit on personalising your marquee! If you choose some of the marquee providers’ furniture and items, make sure to get this in writing to make sure you are all on the same page and to avoid any nasty surprises. Where can the marquee be placed? See if the ground is level, and how easily suppliers can gain access. Will you need a runway into the marquee, what flooring options are available in the marquee: coconut matting, disposable carpet, wood… remember most women will be wearing heels! Find out what is included with the marquee, for instance power and lighting requirements does the venue offer this in your package, is it an extra fee or will you need to rent generator, lighting, dance floor from marquee company. If you are planning on having a band or DJ, find out what power requirements are needed to ensure the have the correct power supply, the same applies with caterers if the venue allows for outside craters find out what needs they will have. Are there toilet facilities available or will these need to be hired in? Find out from your caterers the power and space requirements to ensure they can deliver an amazing service. Find out what is included in their packages: linens, cutlery, crockery, and other equipment. Will your caterers run the bar for or can you bring in a mobile bar company instead? Are there enough toilets nearby or will luxury toilet hire be needed? Is there power/generator, and water supply. Can your marquee be opened up if it’s hot, equally can it be closed and storm-proofed if there is bad weather and how about heaters? We strongly advise you to prepare for any weather to make sure your guests are comfortable and having fun. Ask how long the marquee will take to set up/take down (if hiring), decorating time allotted by the venue, understanding the time frames helps with suppliers understanding their deadlines for setting up and the pack down. Will there be damage to the ground as marquees can sometimes damage surfaces, be careful you’re not left with an unforeseen expensive bill and be liable. Do you have insurance as this is important to ask in case the marquee does end up damaging something. Check that your marquee company or venue have the correct fire regulation procedures in place. Are there fire extinguishers on site? Make sure there is ample parking space, otherwise you may have to consider transportation plans from the ceremony to the venue. Should you be having the civil ceremony at a licensed venue, this simplifies transportation logistics as the majority of your guests will already be on site. Find out if the parking will be on hard standing or a field, and if in a field, do prepare your guests ahead of time for this, especially if it is raining. You are now better equipped to get started! Next step, contact 3 companies for quotes and brochures so you can compare like with like costs. Many companies will provide you with a 3D CAD drawing to help you visualise the space inside the marquee firstly bare, and then a secondary layout once all the extras have been added onto the floor plan. Hockwold Hall is Located near Brandon and Thetford in Norfolk it also borders Cambridgeshire with nearby towns including Ely, and Cambridge.